The early church in Corinth was falling apart. Sin was rampant, divisions were growing, and the congregation was living no differently than the world around them. What had corrupted this once vibrant church? The apostle Paul immediately understood the symptoms: The people had traded God's perfect wisdom for faulty human knowledge. Be Wise guides us through Paul's first letter to the Corinthians, where he encourages his fellow believers to embrace a life of wisdom and truth. 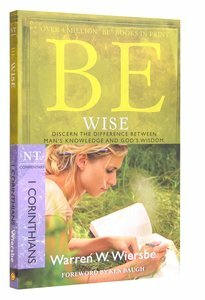 About "Be Wise (1 Corinthians) (Be Series)"
What a difference it makes in your life when you decide to follow God's wisdom instead of man's knowledge!